Most of the time, your home’s sump pump works efficiently and invisibly in the background. In areas with much groundwater, its regular on and off sounds merge with the tapestry of your home life. In areas with low groundwater, the pump may not even turn on for years, if ever. Many homeowners who have sump pumps might not be aware that they have one. Yet locating your sump pump, understanding its operations, and above all, knowing how to maintain it, are all vital to keeping your house in top shape. A sump pump is a small, electrically operated water pump located in a lined hole called a sump pit. The pump is designed to be submerged in water. When the water level in the sump pit reaches a certain height, the sump pump automatically turns on and expels the water. When the water level drops far enough, the pump turns off. A sump pump can protect your home in two ways: First and most important, a sump pump will rid your home of groundwater intrusion on a regular basis. This is the most common use for a sump pump. When a sump pump activates, it is no cause for alarm, as the pump is simply doing its job. Groundwater coming towards the house from below or sideways is captured by permeable rock-filled drains, and that water is diverted to the sump pit, where the pump sends it back outside. Second and far less common, a sump pump has the potential to evacuate large quantities of water during an unexpected water event. Higher quality sump pumps are rated at up to 4,000 to 5,000 gallons per hour discharge flow. This means that, in theory, your home’s sump pump could expel water during a catastrophic event such as minor flooding or a broken water supply pipe. In practice, this rarely happens. Sump pumps are mostly about dealing with groundwater intrusion. At the least, you should check on and maintain your sump pump once a year. However, because the sump pump is so critical to a well-functioning home, try to check that it is working several times throughout the year. Early spring is typically the season when groundwater rises in response to factors such as winter precipitation and snowmelt. So, late winter and early spring is the ideal time to maintain your sump pump. But groundwater movement is difficult to predict, and a host of other factors may come into play, as well, such as soil type, local pumping operations, and changes in precipitation. This means that you should check on your sump pump throughout the year. To locate your sump pump, find the lowest possible point in your house. In most houses, this is the basement or the crawlspace. 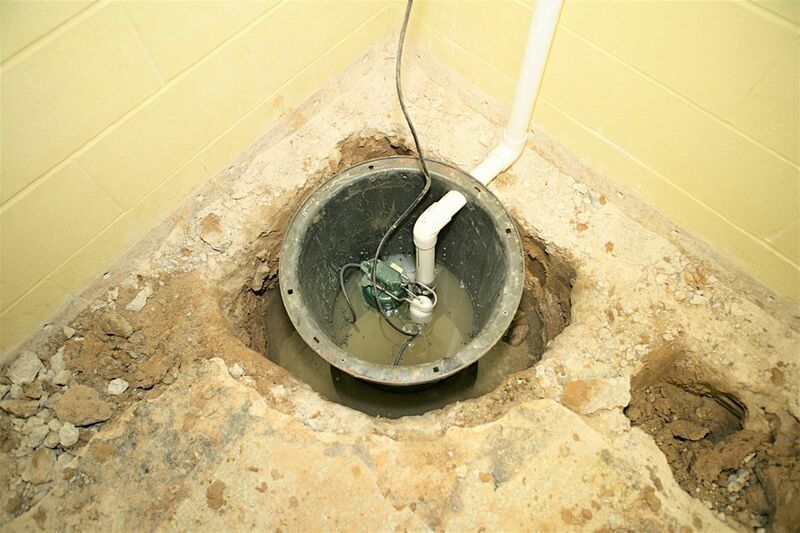 Sump pumps are never installed above ground level, on upper floors. All sump pumps are dependent on a GFCI electrical connection. GFCIs sometimes will erroneously turn off on their own, rendering your sump pump useless. Make sure that the GFCI itself is working and that power is running to the sump pump. Vibrations can cause sump pumps to tilt to the side. Make sure that the sump pump is upright and that its float ball moves freely. Does the sump pump actually pump water? The best way to find out is to pour water into the sump pit. You will need to pour a generous amount to cause the pump to turn on. After the pump activates, stay around to verify that the water is actually discharged. If your sump pump is not operating the way it should, or not operating at all, most fixes are relatively simple and inexpensive. These fixes revolve around the electrical connection, water intake and discharge, and the float and switch mechanisms. The water level may be too low to trigger operations. Or you might have a blown fuse or tripped circuit breaker on the service panel. Finally, pull out the pump and make sure that the inlet valve is not clogged with debris. Check to see that the switch on the pump is working properly. If not, replace the switch. Look at the discharge pipe and clear any obstructions. Also, a sump pump that constantly runs might be undersized for the job. Stepping up to a higher-level pump with greater discharge is the only solution. An undersized sump pump might be the problem. But often, the solution is easier and cheaper: the discharge pipe might have an obstruction that causes backflow. Thus, water that tries to discharge is prevented from doing so. The water runs backward, filling the sump pit, and causing the sump pump to start up again. Should you replace your sump pump if it is old but still working? While this issue of replacing working items is always debatable, some experts say that sump pumps should be replaced every ten years, working or not. If the motor is faulty, it is usually a difficult fix that may be more expensive than replacing the entire sump pump. A majority of sump pump manufacturer limited warranties run between three and five years long.